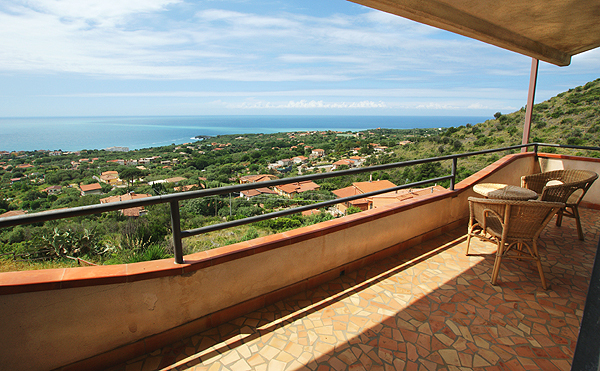 It lies in terrific panoramic location on the Previteri hill somewhat above Marina di Camerota – Villa delle Agavi. The spacious holiday apartment with high ceilings is found on the attic floor of a three-storey house, which, from its exposed location, looks upon the wide sea at the foot of the town. After a long day of excursions, relax at your apartment and recharge your batteries for the day to come. Or take a stroll into town, from Villa delle Agavi it is a ca. 1.2 km walk to the center with restaurants, stores and the small harbor. Beautiful Calanca beach, one of several sandy bays on the northern fringe of Marina di Camerota, is at about the same distance from the apartment. 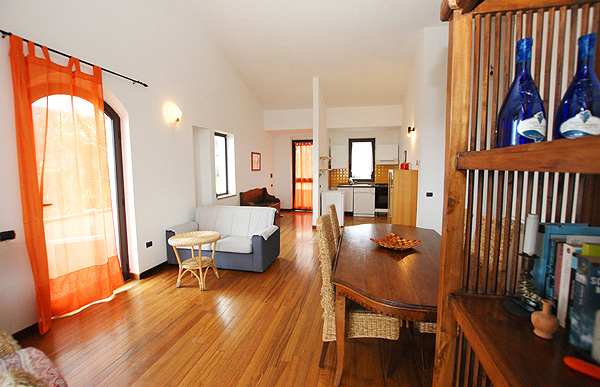 An exterior staircase runs up to Villa delle Agavi, which you enter into the large living-dining room with integrated, but visually separated kitchen area. 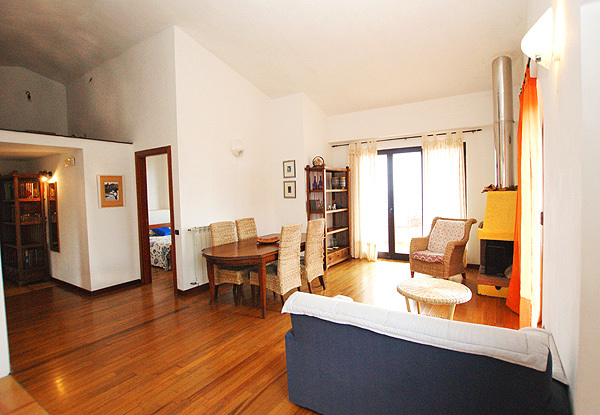 Two French windows and two further windows, parquet flooring and a small fireside provide for a bright, friendly and cozy atmosphere. The room is furnished with a dining table and four chairs, a small sofa, an armchair and TV (Sat-TV). 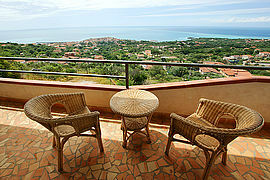 It opens onto the furnished sea view balcony as well as onto a smaller side balcony. 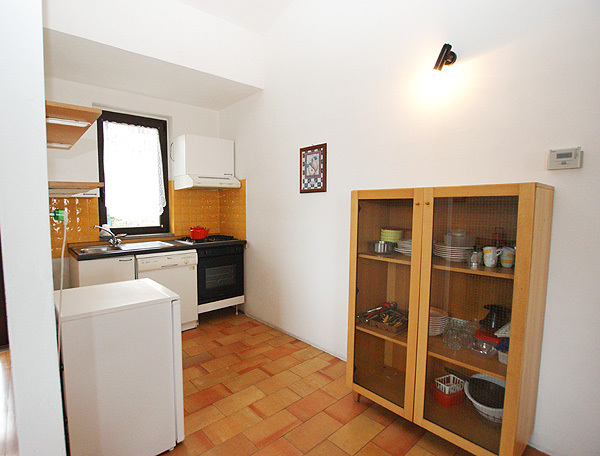 The visually separated kitchen area next to the entrance might seem small, but it does include a gas stove with oven, a refrigerator with freezer compartment and even a dish washer. 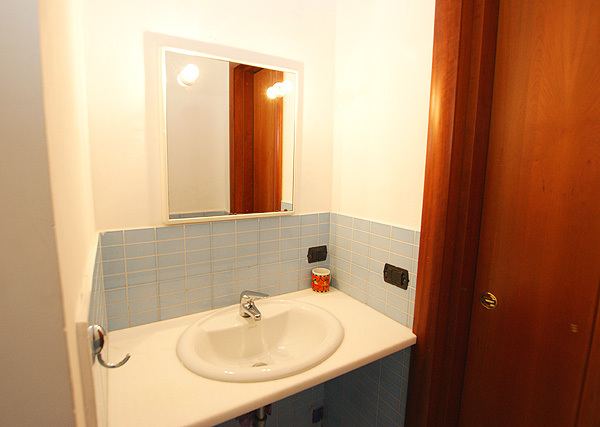 Adjoining the living-dining area there is a sort of small corridor, from which you enter the two bedrooms and the bathroom of Villa delle Agavi. 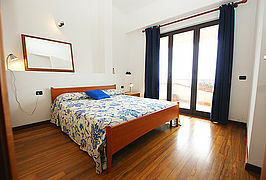 The double bedroom faces the sea and opens onto the sea view balcony. 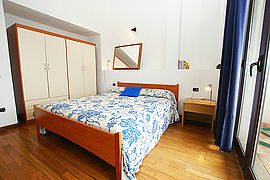 It is furnished with a double bed and a large wardrobe. 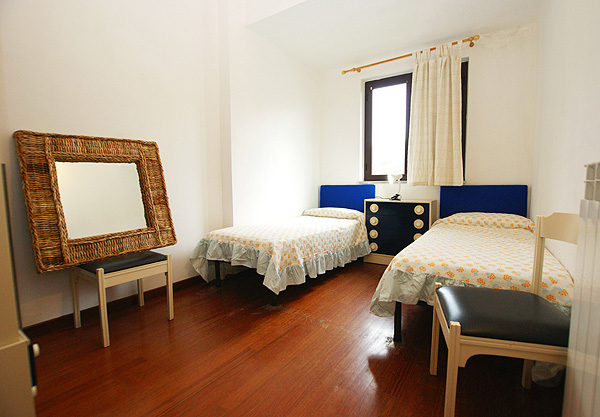 Across from the double lie the twin bedroom and the bathroom, the latter equipped with shower cabin, WC and bidet. 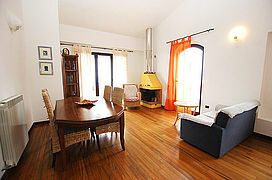 Villa delle Agavi includes free WLAN and central heating as well as a washing machine in the outdoor area. 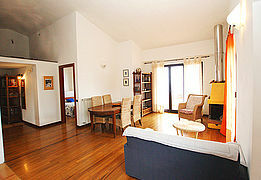 The washing machine is shared with the owner of the apartment, who lives in the house (1st floor), too. 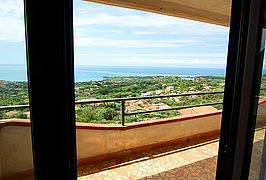 Parking is available on the premises below the house. At supermarket Conad, about 800 m below the holiday apartment, on the main road, you can shop for convenience goods. Bakery Consentino is found on the opposite side of the road, about 50 m further on, next to the gas station. 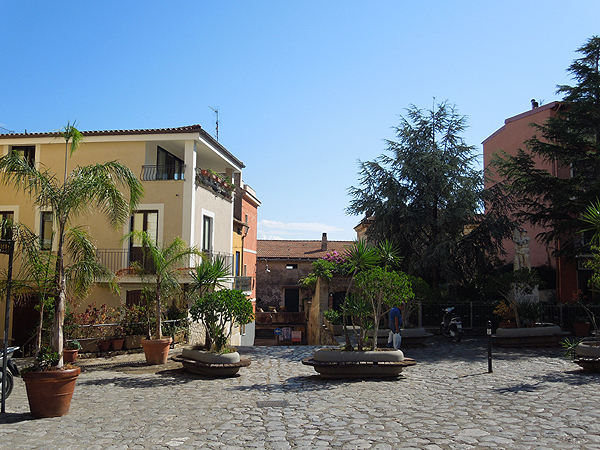 When heading towards the center and the harbor, you find cafè-bars and restaurants, fishmongers’ and greengrocers’ shops, ice cream parlors and small stores selling the prodotti tipici of the Cilento (e.g. Bottega Principe and Il Gusto del Cilento). 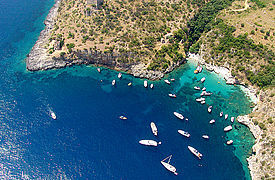 Between the harbor and Monte di Luna, the southern fringe of Marina di Camerota, there is another beach called Lentiscelle. In summer, some parts of the sandy beach are with service (lido), a part remains free. And that is where the coastal hiking trail to Infreschi bay starts. Along the way, you pass by the bays of Cala Bianca and Pozzallo, which are part of Infreschi maritime wildlife park and very good picks for a long day at the beach. The beach bays of the maritime wildlife park are accessible only on foot or by boat. 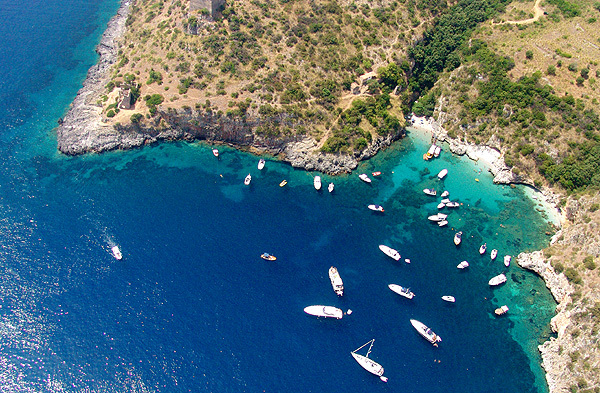 As of April, the cooperatives Cilento Mare and Cilento Blu offer boat trips along the coast to the bays two to three times daily. 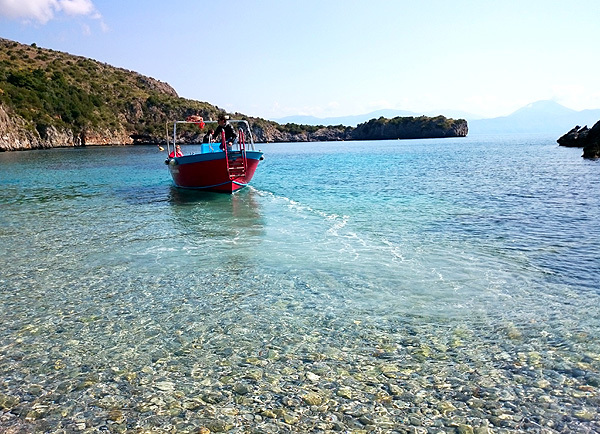 During the trips, the boatmen also head for some of the numerous sea grottos, about which wonderful anecdotes and legends have developed over the centuries. The boat tour takes ca. 50 minutes. 180-degree view of the sea and Marina di Camerota from your balcony thanks to the exposed location of Villa delle Agavi. 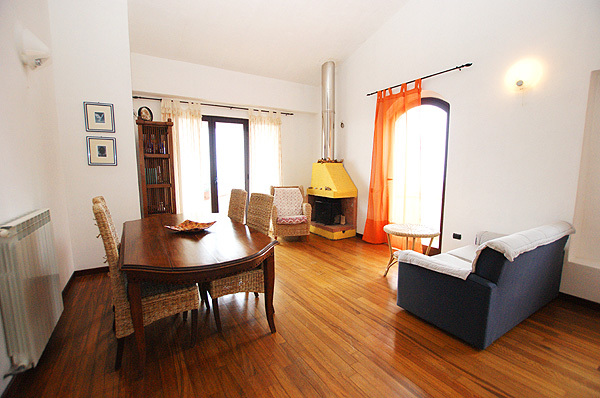 The cozy and bright living-dining room is the first room you enter. 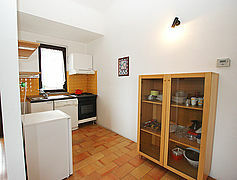 The kitchenette includes, amongst others, a dish washer. 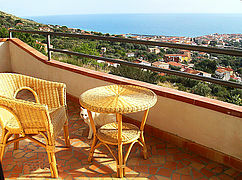 The sea view balcony of Villa delle Agavi. 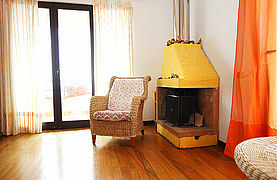 The fireplace in the living area: a cozy spot on cool evenings. 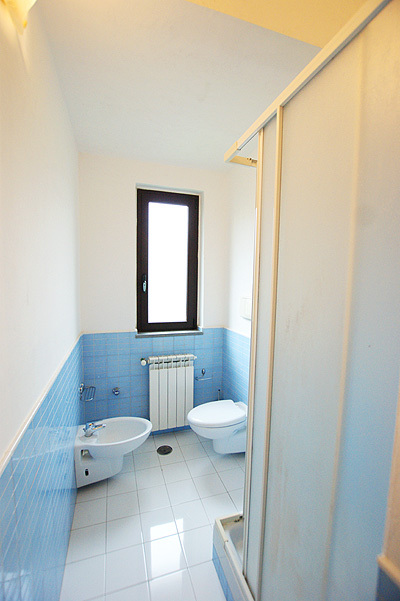 Wash basin and mirror are separated from the shower, WC and bidet by a partition wall. 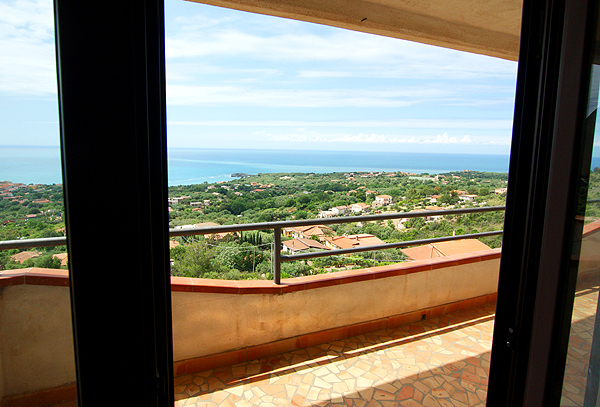 From your holiday apartment you have got the most beautiful view of Marina di Camerota. 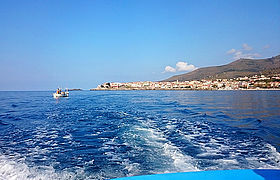 View of Marina di Camerota from the sea. 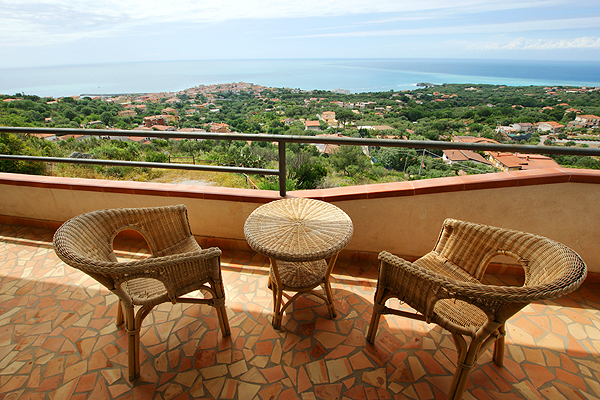 South of Marina di Camerota: maritime wildlife park Infreschi and the bay of the same name (photo: A. Rizzo). 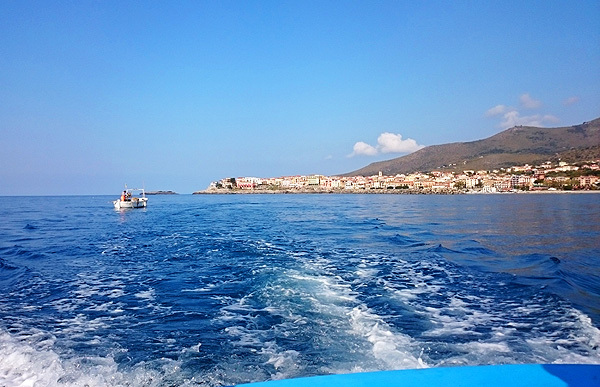 As of April, cooperativa Cilento Mare heads for the bays of the maritime wildlife park every day, which also goes for cooperativa Cilento Blu. Piazza S. Domenica in the center of Marina di Camerota. Prices are valid per week and for the number of persons given in brackets, bed linen, towels and final cleaning included. Days of arrival and departure: flexible. 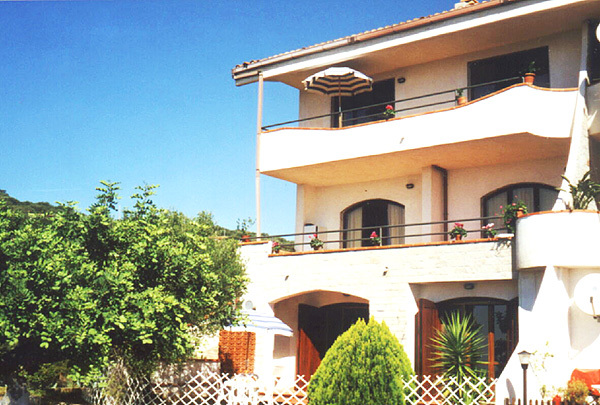 Please note: When booking the holiday apartment for less than 7 days a one-off fee of € 50 is charged in addition to the rental price. - Use of central heating: is charged and to be paid onsite according to use.